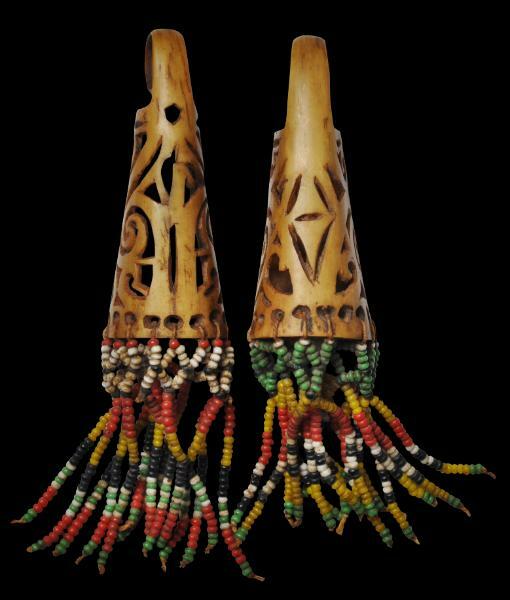 These two ear ornaments, which are not quite a matched pair but were probably worn as a pair, are carved from segments of hornbill casque or ivory and further decorated with beaded tassels. They are from the Iban people of Borneo, the Iban being a Dayak subgroup. aso-inspired scrollwork. One has a non-pierced back; the other does not. The aso is a mythical underworld hybrid dragon-dog female fertility figure. Richter (2000, p. 174) says that such ‘curvilinear vitality’ may be derived in part from dragons or other mythical creatures portrayed in Chinese trade ceramics that were imported into Borneo in vast quantities. The beads are in a variety of colours and are known as ‘peppercorn’ glass trade beads that have most probably come from China and India. 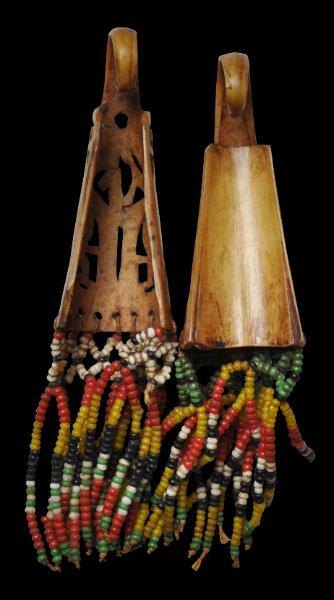 The two ear ornaments here are in excellent condition. Few, if any similar examples, have been published. Beads of Borneo, Editions Didier Millet, 2005.